Farmers incur bigger expenses than their incomes. MSP for farmers does little to help. Losses pile up year after year. A wheat farmer puts in Rs 41, makes just Rs 14. It is nearly the same for a paddy farmer. A Bt cotton farmer puts in Rs 81, makes Rs 40. When a farmer commits suicide, how does it impact us? Is it just another statistic? Or does it say something about the apathy that seems to pervade our state and society? For someone whose life is an endless cycle of borrowing high and selling cheap, making losses and being forced to borrow even more, there seems to be no salvation. While there may not be much in common between the life of an average farmer and that of the city dweller, their lives are inextricably linked. When the person who provides the food on our plates takes his own life, he leaves behind a stark message for all of us. Do we even know how he lives and why he is forced to take his own life? Unlike any other sector, farmers sell their produce at a price fixed by the government. MS Swaminathan, deemed the father of the 'green revolution', argues that this practice must change and farmers must be assured at least a 50% profit. This he asserts would make the farm sector viable. There have been many macro-analyses of Indian agriculture. Here, three farmers give a detailed account of their cost and expense. It is a stark reality check. And demonstrates why Swaminathan may just be right. Mohammad Fasih, 59, grows wheat on 10 bighas. Lives in Khan Jahanpur village, in Muzaffarnagar district of Uttar Pradesh. His farm of 10 bighas, on an average, produces about 3,500 kilos of wheat. At the government-ordained minimum price of about Rs 14 a kg, Fasih will earn nearly Rs 50,000 for his produce. Considering that the sowing-to-harvest season of wheat in this region is from November to April, this is Fasih's earning from a six-month period of hard labour. This is roughly Rs 30,000 more than half of the average annual per capita income in India. And all of it is tax-free. So far, so good. Fasih ought to rejoice that he is doing so well in otherwise taxing economic conditions. Except that, this is not true. Just like any other economic activity, he incurs a certain amount of spending to make those golden fields come alive. Take a look at his expenses. So what does this earning translate into for Mohd Fasih? A loss. Every season. Every year. And the size of the loss? At least Rs 1 lakh every season. "Kheti me toh ab kuchh naheen rakha," (There is nothing left in farming anymore), says Fasih. Suresh Bolenwar, 50, grows Bt Cotton on his 10-acre farm in Yavatmal's Hiwara village, Maharashtra. Maharashtra's Yavatmal district falls in the Vidarbha region, whose Bt cotton fields are witness to some of the largest number of suicides by farmers. Fifty-year-old Suresh's expenses per acre add up to roughly Rs 25,000. He pays at least Rs 75,000 as interest on loan at an astounding interest rate of 25% bi-annually. At an annual loss of Rs 1,60,000, is it surprising that farmers like Suresh are trapped in an endless cycle of loss and debt? "Purana karza itna ho gaya hai ki chuka hi naheen sakte (My old loans have swelled to such a large amount that we may never be able to pay them back)," Suresh says. "Ab to isi intzaar me rehte hain ki karza maaf ho jaeg (Now we just live in the hope that our loans will be waived)," he adds. 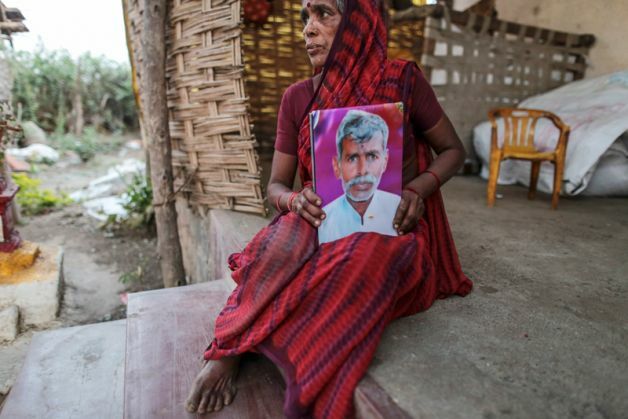 Rami Reddy, 45, a paddy farmer in Manikyapuram village of Warangal district in Telangana (formerly in Andhra Pradesh). Sows on one hectare of land, part of which he owns, part he takes on lease. Andhra Pradesh has among the highest farmer indebtedness in the country. The average size of a rice farm is one hectare, which can produce at least 40 quintals of paddy. 80% of farmers like Rami Reddy are dependent on private moneylenders for loans, who charge them an annual interest rate ranging from 60 per cent to 120 per cent in different parts of the state. At the mercy of these moneylenders, they run an annual loss of at least Rs 1,00,000. Commenting on their situation, Dr GV Ramanjaneyulu, Executive Director of the Secunderabad-based Centre for Sustainable Agriculture, says that for those farmers who do not commit suicide, life is actually worse.